The ICE Group has a long-standing relationship with Japanese shipyards, starting in 1982 when the 280 m long towing tank at ICEPRONAV in Galati, Romania was established in cooperation with Mitsui Engineering and Shipbuilding (“MES”). In more recent years, ICE has had the privilege to provide ship design services to Sasebo Heavy Industries (basic design of a large LPG Carrier), Kawasaki Heavy Industries (drill ship) and Mitsubishi Heavy Industries (Cruise vessel) as well as to MES (Bulk Carrier BWT retroﬁt and LQ design). 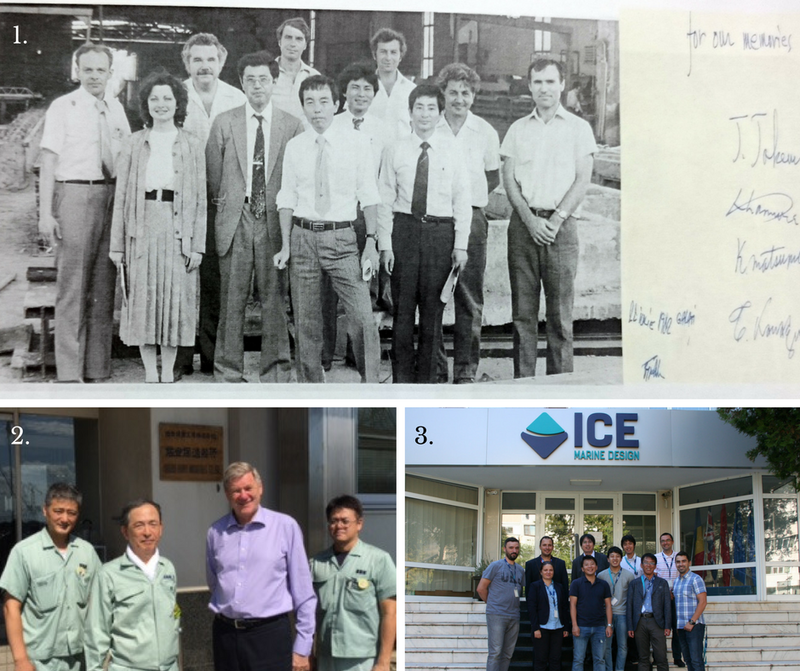 The pictures show (1) a team from MES at Icepronav in Galati in 1982, (2) the ICE Chairman at a meeting with Sasebo in October 2016, and (3) a team of engineers from KHI visiting ICE in Galati in September 2016.